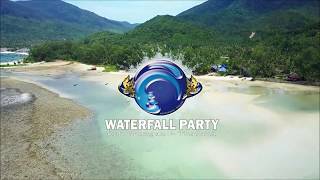 The Waterfall Party is a unique party series taking place in the heart of a valley inside the jungle of Ban Kai, featuring a beautiful waterfall & lagoon set amongst giant rock formations. The event features local & International DJs spinning Deep House, Tech House, Techno, Electro & Progressive House on a massive sound system, as well as professional fire dancers, lasers & fluorescent neon decoration and an all-night BBQ. A huge canopy enables the party to take place even if it rains.